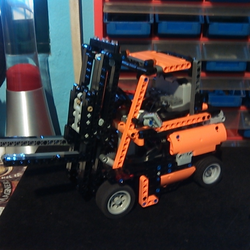 This MOC is inspired by the famous orange forklift by LINDE. I tried to made a compact version, 30 cm wide (including the mast) by 22 cm tall. Including all the features in the real forklift, using PF components. The fist and more important feature is the mast. It moves in two different ways, up and down (being the most recognizable feature in a forklift), raising the load apron up to 30 cm. 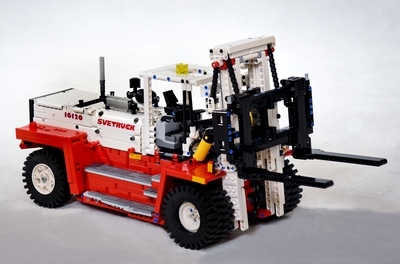 Its pulled by a technic chain to be more like the real forklift. When the mast goes up the front lights turn on and the pneumatic pump is activated. I installed a PF control switch to allow the pump to work without the mast moving. The pneumatic sistem is used to adjust the forks for larger cargo, controlled by a switch next to the drivers seat. The mast also moves back and forward driven by 2 mini linear actuators. When this features is activated the back lights turn on. The forklift is driven by a M motor connected to a differential in the front wheels. The rear wheels steer the forklift, using gears to lower the speed of the motor. The battery is located where the gas tank wold be, and is very easily removed. All the features are contorted by two Power Functions IR Remote Controls. The wheels on this MOC where painted orange to match the real forklift. The in side, being the rims was painted crome. It has 10 stickers, all the safety warnings (4), Linde logos (5) and a metallic plate on the platform the driver uses get to the seat. I am trying to make instructions for this set, if you have any suggestion please tell me in the comments.